Our Little Inspirations: Shut the Front Door!! I knew sooner or later I'd see a stamp set with this catchy phrase, and when I spotted it at Unity, I had to buy it! When I first started hearing this in tv ads, I thought it was a bit too suggestive, but it's caught on big-time and I guess there's really nothing wrong with it after all. The suggestion was probably just in my mind :) I'm going to put a sentiment inside that says "Someone told me you're having another birthday!" I used a piece of cool caribbean cardstock, and embossed it with the SB so Trendy M-bossabilites. The door from Unity's Shut the Front Door Itty Bitty was paper pieced with scraps of matching card stock and paper, and I added some gold paint pen accents to the door trim and "hardware." The background is a piece of BG kraft dsp and I stamped it with the Unity Splatters and Stars - all boy Itty Bitty. I'm entering this into the Unity Friends with Flair challenge. Hi Carol, I'm not a fan of that saying either, but maybe we have to go with the times. (don't have to like the times though). 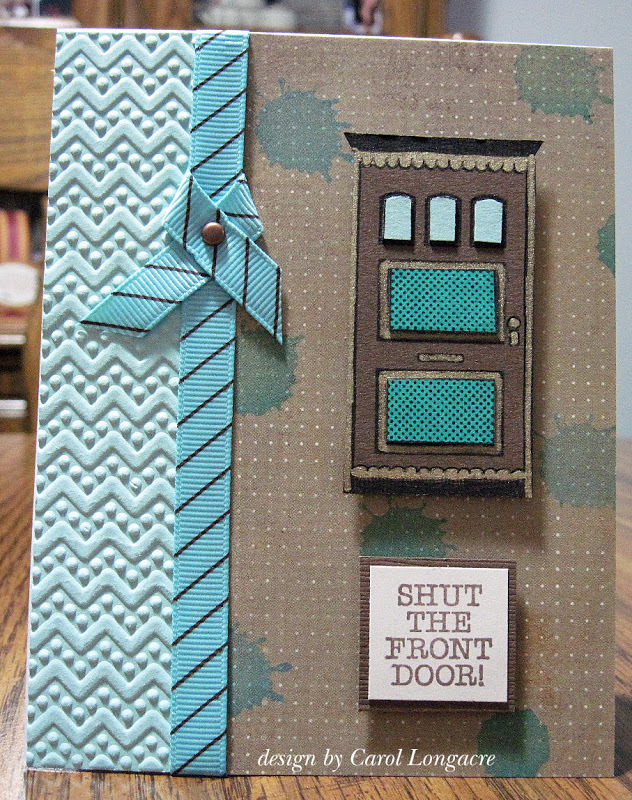 Anyway you did a great job on this card: the door, the embossing (I love that ef) and your background paper also. Also, I'm behind on commenting, but I just noticed your merry Monday card and it is beautiful. I'm really loving the cherry Cobbler paper more and more each day. Your orange card is sweet as can bee and that MWT card is just perfect. Love the piercing and your brads. All winners my friend. Cute paper piecing on the door. Love the ribbon and pretty embossing. I really like that cool caribbean cs and never bought any. Get out my list!! I think it is fun and fresh! It was a cute choice of stamps! I also love the colors you decided on. Maybe they will post last weeks winners soon. I see others were asking. Fun! Love the splatters on the background paper and the paper-piecing of the door. Nice ribbon treatment, too. 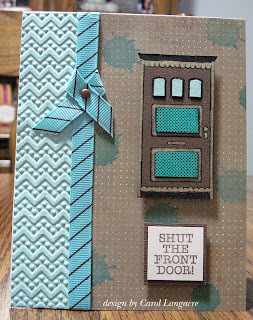 Love the paper-pieced door and your colors, great card! love the texture! great color combo too. Awesome card! Love the colors you used, and the paper pieced door is really cute. So cute! I love embossing you did, and the colors are beautiful! I just saw this samp set on another card. It must be this week's theme! I love your embossing and paper piecing. Wonderful colour combo, love the sentiment. Cute! Great textures and colors! Pretty color combo, which makes this card just beautiful. I'm not always about what's in either. Shut the front door! Such a great card. TFS. Ha! Love it. I like that sentiment too, but truly LOVE the colors your chose. And that little ribbon bit with the brad I'm SO going to copy! TFS! Cute card, love the door! Great card! I love the embossing folder! CUTE and love those colors!!! I guess you could probably take that sentiment to mean several different things - but it's going to be great for a birthday!